New Balance Fresh Foam Vongo v3 are stability cushioned running shoes. 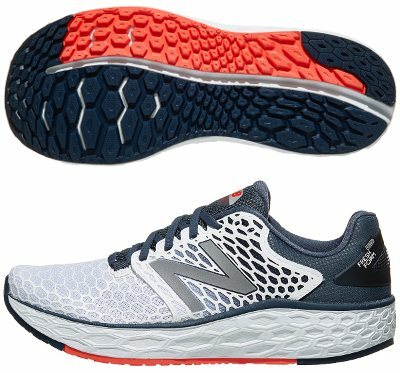 Current third edition New Balance Fresh Foam Vongo v3 gets closer to targeted "alternative" (aka not classical) approach for running shoe with pronation support, abundant cushioning, low drop (just 4 mm) and lighter than competitors. Those runners looking for a more traditional approach within New Balance's lineup can choose between reliable 860 v8 and premium 1260 v7. There are several changes compared with its predecessor Fresh Foam Vongo v2 and again visual aspect has nothing to do with those awful running shoes with pronation support from not many years ago. Upper is based on multilayer mesh plenty of micro ventilation holes to bring breathability to next level. Strategic "3D Screen" printed layer wraps midfoot in kind of flexible cage for secure and dynamic fit while bootie construction improves comfort and prevents chafing. Heel counter has been redesigned for enhanced stability. The impressive one-piece midsole in Vongo v3 is obviously made of well known Fresh Foam although there are a couple of interesting changes: it is 2 mm thicker to increase amount of cushioning and internal geometry of typical hexagons has been reengineered to improve response, something based on feedback from other running shoes like popular Fresh Foam Zante v4, at the same type it supports pronation control. It keeps almost full length groove which splits outsole in two areas with more robust interior one for improved stability and expected apertures in forefoot for smoother transition. Lug pattern reminds premium Fresh Foam 1080 v8 with hexagonal lugs changing size and shape depending on the area to adapt better throughout gait phases.